Name one restaurant: Where do you take out-of-towners? Tough question, that. It’s one I answered in my 2002 Pacific Northwest Dining Out guide — offering up my “Top Ten” picks as well as 25 other favorites, highlighting everything from homey to haute. Interestingly, nearly every one of those faves is still going strong six years later, despite the fact that several have been sold. Granted, if I were to do a “re-do” of my picks today, I’d certainly add a few newbies, probably X-out a couple of oldies and do some rearranging: adding Canlis, for example, to my top 10 (it was listed under “Other Favorites”) and throwing Lynnwood’s Matsu Sushi over for its neighbor, Taka Sushi. I had drinks and dinner at Lark and Licorous a couple weeks ago with friends from California, so nix that. Place Pigalle, Matt’s in the Market, Steelhead Diner? Well, Noelle’s friend had already taken them to the Market, twice, so I should take them somewhere else. What about Spring Hill — which I’m dying to try? Nope: I didn’t feel like driving to West Seattle. Lampreia? Ate there on my birthday. Elemental, where I might check out it’s new adjunct, Elemental Next Door? Uh-uh: Noelle’s not much of a drinker so the charm might be lost on her, and besides, they don’t take reservations. Flying Fish: nope, too noisy. Canlis? Yes! (No.) Yes! (No.) Yes? No, I wanted something a bit more casual. And then it hit me: Cafe Juanita! In fact, it was everything Leslie Kelly said in her glowing review today in the P.I., right down to the helpful low-key sommelier, the incredible aperitivi pairing, the signature Arneis-braised rabbit and on-the-bone branzino, plus the fact that chef/owner Holly Smith (who was off in Vancouver) had left her kitchen and dining room in very capable hands of her stalwart crew. Great food, drink, service and ambiance? No surprise to this longtime fan. So. If you had to choose one restaurant to impress food-savvy out-of-towners, do tell: Where would it be, and why would you go there? my first job was as a dishwasher at cafe juanita when i was 15. i ate a lot of their tiramisu. first place i tried rabbit. first place i got a serious kitchen burn. because i went there last night, i’ll say i’d take out of towners to serious pie. you’re in, you’re out, and it’s great. lamb belly and peach pizza. so yuppie, but perfect with the crust’s burnt ends. There are so many great places in Seattle to choose from! I’m pretty sure I’d take them to Cafe Piccolo, http://www.piccoloseattle.com/, in the Maple Leaf area. This family run establishment has never disappointed. The room is open and you can watch the chef as he cooks up your meal. The menu runs mostly towards Italian but there are other options to pick from. Save room for their tasty desserts too and don’t forget to order coffee which is served in individual french presses full of delicious Caffe Vita coffee. You know, most of my family and friends from out-of-town would pitch a fit if I tried to take them somewhere expensive. They want the things they can’t get where they live and are mostly interested in the wide range of Asian restaurants. We tend to go for sushi, dim sum, Vietnmese, or Thai. Probably the most popular choice (and the one they request when they return) is the Noodle Boat in Issaquah. I know you only asked for one restaurant, but. . . when doing the obligatory visit to Pike Place Market, I make sure we stop in at The Crumpet Shop and Pike Place Chowder. We have friends who visit every other month, and they are always disappointed if we don’t take them to Nell’s. Great Northwest-oriented food, attentive service, elegantly casual atmosphere, and just a quick circle around Green Lake from our house. For excellent food, great atmosphere, and good prices, I take out-of-towners to dinner at Osteria la Spiga, and then to Volunteer Park Cafe for brunch the next day. The list can go on and on – guess they’ll have to move here! It would have to be Pasta Freska. Chief Mike is fun and funny, food is priced right, extremely tasty and quite filling. I recently took new friends from Northern Canada when they came into town. I met them in Bali last winter; they turned me on to the best little beach cafe and I wanted to share Pasta Freska with them. They left very happy. It has to be Ray’s! I have two qualifications. It has to be something they can’t get at home and someplace that takes chances. Someplace where the food is interesting. Where I can get something besides salmon or steak or prime rib. For instance tonight my lovely bride and I ate in our favorite restaurant in downtown Seattle. I started with an incredible octopus appetizer with fresh peas, a fantastic aioli and pork belly followed by an entree tangine of suckling pig with morels. OUTSTANDING. My bride had a superb ravioli appetizer followed by an entree tangine of goat with dates and cinnamon flat bread. Also OUTSTANDING. Where were we? Lola. And when we have visitors we go to Lola. They get Tom Douglas who is Seattle’s best known chef and they get to eat at my favorite restaurant. Something completely different. My back up is Cactus. Much prefer Madison Park. Would do Cafe Juanita but I am usually picking up the check and dinner for more than two at Juanita would set me back a mortgage payment or a tank of gas, take your pick. Our out of town guests always go wild for Wild Ginger! We took out-of-towners to Siam Thai in Mill Creek. You cannot really go wrong with Thai food in the Seattle area- there’s good Thai, really good Thai and the best Thai. Siam Thai fits into the best Thai food around!!! It even beats our favorites, Thai Ginger and Thai Bistro. Buddha Ruksa in West Seattle, or if feeling extremely decadent (and/or hungry, on a weekend), Salty’s crazy brunch on Sat. (Sun. is usually too busy). BTW Spring Hill is GREAT! “I didn’t feel like driving to West Seattle” but you will drive to Kirkland?! RE: My driving to Kirkland rather than West Seattle. Hey, I live in Edmonds! It takes 20 minutes to get to Juanita if I go around the north end of the lake via Bothell Way. Much shorter than driving from Edmonds over the W. Seattle Bridge for a 6:30 rezzie. In-laws were in town last month, and we took them to Ray’s — as much for the food as for the outstanding view and sunset. 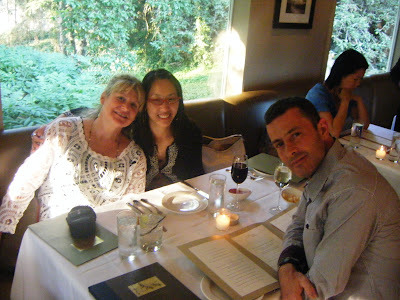 Mediterranean Kitchen in Bellevue is always a big hit with our out-of-town guests. We’ve got two kids and most of our visitors tend to have young families as well. One place that we’ve always had great success with is Chinook’s, at Fishermen’s Terminal. Sure, they don’t take reservations, but you can call in on your way and the wait is made much more bearable with the fishing fleet right in front of you! The food isn’t fancy, but straightforward seafood, with a mix of other dishes for those non-seafood eaters. I haven’t had many out-of-town guests, but my friends and relatives in other cities have hosted me wonderfully, and my chickens are starting to come home to roost. 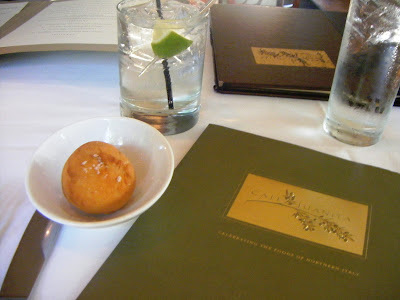 Though I’m still building my list of restaurants for guest entertaining, Cafe Campagne is high on my tentative list. Sophisticated and near the Pike Place Market. Wild Ginger is up there, too, as are Chinook’s at Fisherman’s Terminal, Anthony’s and Ray’s Boathouse for seafood. But I only recently returned to Seattle after 30 years away, so I am listening carefuly to recommendations from my Seattle-area sisters, and reading the postings here carefully. I know this isn’t very Northwestern, but Harvest Vine. It is just stellar at the moment. Lark is great for showing out of towners what the food here is all about – so to is Sitka Spruce (with an Italian bent). I would take them to Brasa (www.brasa.com), for the “Whistling Train Roasted Pig” and an undoubtedly wonderful evening! brings back memories of every good small restaurant I have eaten at in Italy. Campagne, of course. And for something a tad less fancy, Marco’s Supper Club (outside in the back). Late lunch at Green Leaf. Or dinner at Monsoon. I could go on forever, it seems, but won’t.